Forza Horizon 4 has brought in over seven million players since it launched back in October, which marks an impressive level of success for the open world racer. Developer Playground Games hasn’t detailed how that breaks down across platforms or spoken of total sales numbers versus those who’ve gotten in via subscription, but it seems the game’s early life has been healthy. We haven’t heard Microsoft boast of many sales numbers since the launch of Xbox Game Pass, opting instead to mark milestones by player count. But the availability of a free subscription doesn’t seem to be slowing down actual purchases. 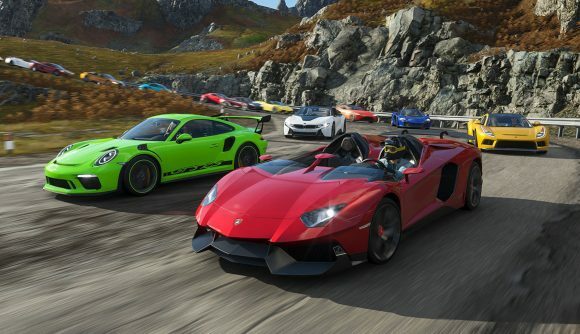 In October, NPD reported that Forza Horizon 4 sales made up “the highest launch month dollar sales in Forza franchise history.” The official Forza Twitter announced the new player record today. It’s similar to the story we’ve heard around Sea of Thieves sales – first-party titles on Game Pass so far have been selling more, not less. We don’t have a clear indicator of what the long-term sales of these games have been, but new players have been coming in at a solid rate. Microsoft reported that two million players had gotten into Horizon 4 on launch week, so now we’ve got another five million in just a handful of months. While we don’t know how many of those players are on PC, it’s a bit of a moot point given the game’s cross-play and cross-buy support – and as our PC performance review indicates, it’s an excellent port. Rumours of dedicated PC Game Pass suggest good things are in store for players of titles like Forza Horizon 4. Now if only the Windows Store would get its long-overdue update, we’d be set.